The Seed Funds Savings & Loans Limited (TSF) has organised a clean-up exercise at the Kaneshie market to mark the company’s fourth anniversary. About 150 participants from all branches of the company and some staff from the Accra Metropolitan Assembly (AMA) participated in the exercise. The exercise was also to help promote environmental hygiene, which would promote good health among the citizenry. 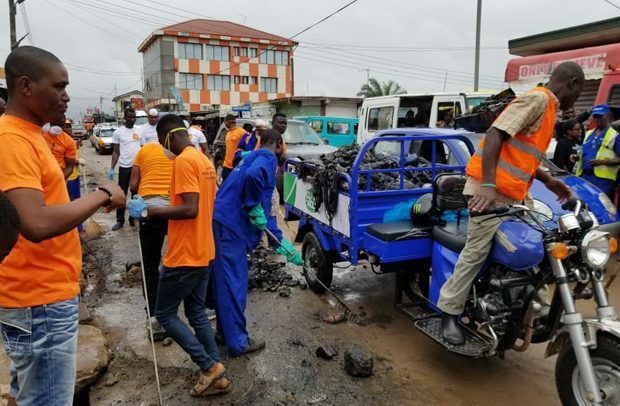 The staff were divided into two groups— the first group cleaned the Kaneshie bus station and the second group cleaned from the TSF Kaneshie branch to the Kaneshie Police Station. The groups cleaned the gutters and swept their various locations to keep a clean and healthy environment for the people living in and around the Kaneshie market. Speaking during the exercise, the CEO of TSF, Albert Mmegwa, stated that TSF is committed to promoting good environmental practices as their corporate social responsibility. “This is not going to be the first time we are embarking on a clean-up exercise with the communities. As has always been our tradition, The Seed Funds will continue to support the communities in which we operate. We are hopeful that this exercise becomes a daily routine to ensure a clean, safe and a healthy environment for us all,” Mr. Mmegwa added. The Seed Funds Savings & Loans is amongst the leading savings and loans companies in Ghana. Since its inception in 2014, the company has developed structures and strong pillars which have ensured their consistent growth in the financial industry in Ghana.